It's almost hard to imagine, but there has never been a Halloween franchise toy based on original scream queen, Laurie Strode, played by the transcendent Jamie Lee Curtis. Don't worry horror fans, the day has finally come thanks to the fine folks at at NECA who have been teasing this upcoming figure since October last year. NECA is thrilled to announce a two-way action figure debut from the 2018 Halloween movie! The Ultimate Laurie Strode action figure is not only the first ever figure of the character, but the first to feature the authorized likeness of Jamie Lee Curtis. Based on her appearance in the thrilling new Halloween movie, Laurie stands over 7" tall and has received the Ultimate treatment, with over 25 points of articulation, and tons of attitude and accessories. The figure comes with 2 heads, shotgun, rifle, revolver, knife that fits into a sheath on her hip, and more. Display-friendly deluxe window box packaging with opening flap. 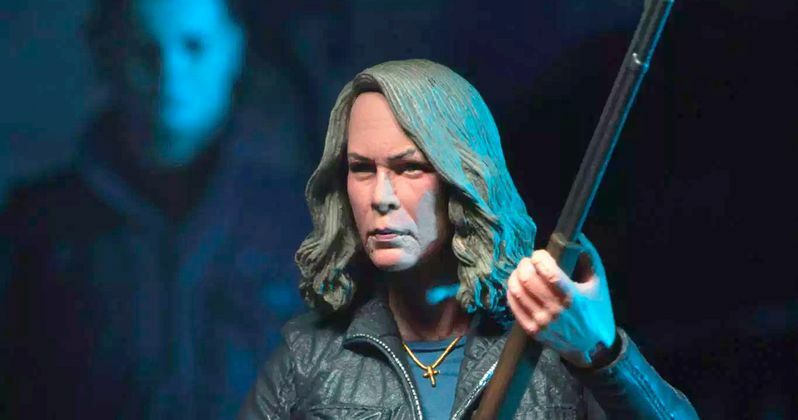 You can get your hands on the Ultimate Laurie Strode Figure from your favorite NECA dealer some time in the second quarter of 2019.